Laufenn’s I Fit studless winter tire earned 2017 Red Dot Design Award recognition for a design that optimizes performance on wet and snowy roads. SEOUL, South Korea—Hankook Tire Co. Ltd.’s Laufenn-brand I Fit studless winter tire earned 2017 Red Dot Design Award recognition for a design that optimizes performance on wet and snowy roads. “This year’s win with Laufenn brand’s I FIT once again proves Hankook Tire’s innovative design leadership and premium brand asset, as recognized by the prestigious global design awards,” Hankook said in a news release. The I Fit was designed with an advanced tread pattern and rubber compound best suited for snowy, wet roadways and driving conditions, Hankook said. 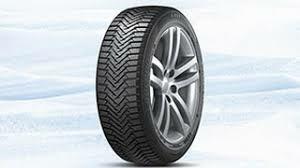 The tire’s structure is designed to offer enhanced braking, a comfortable ride and longer treadwear. Last year, Hankook said, Laufenn-brand tire sales increased 350 percent over 2015. With sales in North American and Europe on the rise, Hankook said it sees this as an optimal time to push the brand on a global level. The tire maker said it plans to expand coverage to 86 countries by year-end from 62 last year. “Following last year’s multiple wins from Red Dot Design, this award once again solidifies Hankook Tire’s commitment and determination to lead future driving through progressive innovation and creative design,” Hankook Tire CEO and Vice Chairman Seung Hwa Suh said. The Red Dot Design Awards honor outstanding design, communication and concept for innovative products in three categories. They are the domain of Germany’s Design Zentrum Nordrhein Westfalen, which has bestowed the awards since 1955.